East Midlands Bloggers go to Lincoln Christmas Market. I can't believe around 8/9 months ago a group on Facebook/Twitter was created for East Midlands Bloggers and we started to outreach in search for bloggers around my area. Little did we know what was in store and how many people we'd encounter, some have become some of my absolute bestest friends! We spoke about the idea of attending Lincoln's Christmas Market on our first meet in May and I knew instantly I would make the time to go. So when December rolled round quicker than I had anticipated I couldn't wait to pop on the train and see some lovely bloggers from around my area up in Lincoln. It's good to point out here that some of the bloggers from our first meet up didn't attend this event due to other commitments which made me feel very sad (I know most of them will read this so giving them a small guilt trip!) very excited to be organising a get together with those ladies in the New Year though! I hope you enjoy reading this post and if your from around the East Midlands and want to get involved in our meet ups I'll leave the information in how you can at the bottom, enjoy. The Lincoln Christmas Market is iconic to Lincoln's festive celebrations. Lincoln's Cathedral quarter comes alive in December with entertainment, stall holders, food and drink, craft makers to join them for four days to create an experience not to be missed by the public. It'll be impossible to not feel festive after you walk amongst the big market site, with around 280 stalls to take a look at nestled around Lincoln Castle, Lincoln Cathedral, the Lawn complex and also in other venues and down streets along the trail. There is something for everyone to enjoy, just remember to bring your most comfortable and sensible footwear for the long walk. As we went during the day I couldn't enjoy the lights and colours of the stalls but wasn't disappointed. As this was known to be the busiest day of the market, nothing prepared me for the amount of people that would flock to Lincoln, even from the moment I stepped off the train in Lincoln. The first stop on our agenda was a little cafe called Stokes at the Collection Museum who kindly allowed us to reserve a table and meet up here prior to walking around the market. A family run business since 1902; Stokes offers a wide range of food and coffee for all to enjoy. They had the most beautiful decorated space with lights and snowflakes everywhere, it felt so cosy and festive in there. Our table was also situated next to a very well decorated Christmas Tree and even Santa was there too, amazing! After lots of decision making and wondering what my appetite fancied, I opted to try out their Country Vegetable soup and bread. I wasn't disappointed. Presented on a wooden board was a generous helping of soup, with what looked like a cheese toastie and some croutons to dip into the dish as I wished. The soup had a generous amount of vegetables, even including sweetcorn and onion which surprised me for a vegetable soup but totally worked! I now want to try out my own vegetable soup recipe for this perfect winter warmer! The bread had a cheese flavouring to it and was the best choice of dipper for the soup, I had to hold myself from ordering more of that bread. After we all consumed our lunches it was onto the goody bags, myself and Hannah didn't want this meet up to happen without some kind of festive treat for our bloggers. We did leave this part really last minute but we managed to pull out the stops with some help from some VERY generous brands and charities who took the time in ensuring the goodies got to us in time. I was so excited for the products we received and ever so much I have been using them since I got home and not sure where they are in my house right now to show you image form, sorry. It was a real joy seeing what each blogger thought to their goody bag and myself and Hannah ensured a cracker and Christmas card was thrown in there for good measure. After a long time enjoying the contents of our goody bag we decided to take a quick selfie with Santa and head off to the Christmas market, my feet felt prepared and ready for the big hill! Walking towards the market there was a real atmosphere building to what awaited us once we arrived at our destination, definitely helped with the sound of Christmas songs being played through speakers along the route. Myself and Sherry particularly enjoyed this element and were easily the entertainment for the rest of the group with our singing! The first thing that I spotted was the Lincoln Cathedral, the last few times that I have visited the city in the past it's the one thing that's always stood out amongst the city. It's such a beautiful building and I was hoping that we'd get a chance to look inside before we left the market. Now whilst I was enjoying looking at the variety of stalls the markets had to offer, completely lathered with homemade items (lots of which were Christmas themed), food, alcohol and so much more! I couldn't quite believe how many stalls could be compacted into the space! My main mission for the trip was to get my hands on some mulled wine, because no trip to a Christmas market is complete without a cup (or two, or three) of some good mulled wine. When I spotted the sign 'MULLED WINE AND MINCE PIES' I knew I had found what I had been looking for.. it even included the merry monks of Lincoln Minister, Round Table who got me to sing a Christmas carol to receive a cup of their mulled wine. Obviously I was more than up for this challenge and sang 'tis the season to be jolly' in return for honestly a delicious cup of mulled wine! I also enjoyed the mince pie I purchased with it too, what's December with a couple of mince pies? What I didn't prepare myself for was all of the yummy treats available in the food court, check out the lot above. I found it ever so hard to decide which treat to take home with me back to Leicester. Éclairs, Cinnamon Buns, Doughnuts... you think pastries and I'm pretty sure they had it available on this stall. I definitely enjoyed the chocolate éclair that I decided on on the long train ride home! It took around 2 hours to get home so I needed the perfect treat to get me through. I couldn't believe how big the market was overall, I couldn't take in everything and felt extremely overwhelmed by what Lincoln had to offer to it's visitor during the festive period. Obviously a visit to Lincoln would not have been complete without heading over to the Lincoln Cathedral. What an absolutely beautiful building it was! The Cathedral was full of people and I particularly enjoyed listening to the band that was playing at the front of the Cathedral playing Christmas carols, getting us all in the festive mood. Overall I absolutely loved the market and would definitely recommend for anybody to take the visit, it's so worth it. I didn't even spend as much as I had thought and definitely came home satisfied. I'm already talking with my family about our visit next Christmas! 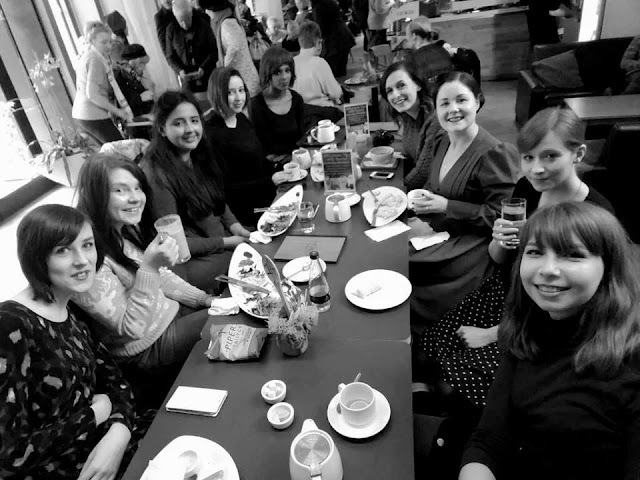 It was also really lovely to gather with blogging friends and new blogging friends too. I cannot wait for 2016 to begin and for more East Midlands Blogger Meetups to happen too! If your from the East Midlands and interested in attending our events you can find us on Twitter or Facebook (click the links!) myself and Hannah are always engaging with new bloggers and thinking of ideas for future meet ups! Great post and photos. I couldn't make it this year due to surgery but hopefully I'll be there next year! Ooh I love a little goodie bag of products! I'm yet to go to a blogger meet up near me, I always seem to clash with other things! Also, that soup looked amazing, I never think to get soup but you just can't go wrong with it! Reading this has made me want to go back to the market again, you make it sounds so good! haha. I can't believe how long its been since the first event now, so pleased to have been able to meet you all. Lets get another one in the diary soon!